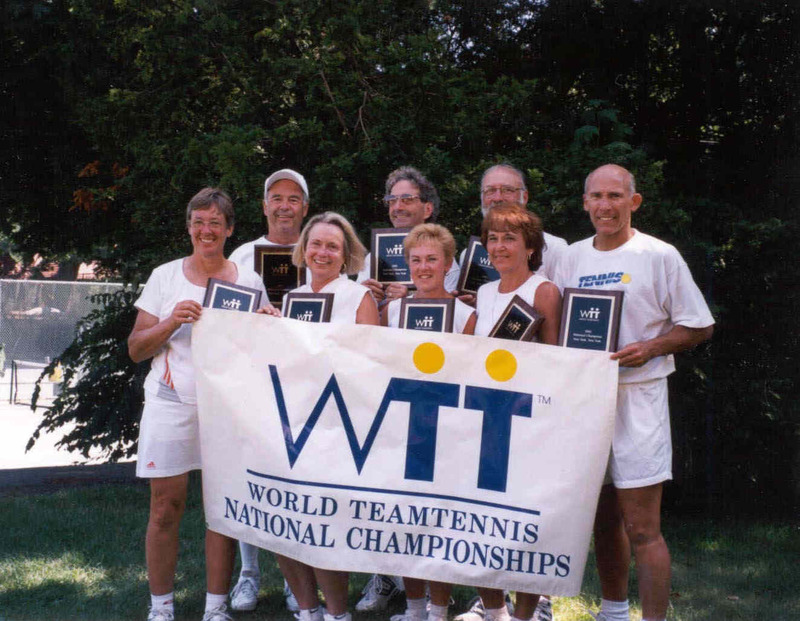 The WTT Seniors 3.5 team (Bytner Travel) from Albany, NY won the 2002 WTT Seniors National Championship in the 3.5 Division in Forest Hills, NY. The National Championships were played at the West Side Tennis Club in Forest Hills, NY, the site of the original US Open. The Team players are as follows: Jean Hooper (Captain), Barbara Clay, Stephanie Temshiv, Marie Stone, George Della Rocco, John Zeh, Barry Loffredo and Larry Rorick. Bytner Travel qualified for the national championship by winning the WTT National Qualifier in Central Park,Schenectady. After driving 2 hours on saturday morning we did not play well and only beat our 1st opponent by 8 games (would have been a bigger margin but a certain #1 ranked Open ETA Mixed Doubles team got drubbed 6-0 at 5th mixed (snore....). The next two matches (saturday p.m. and sunday a.m.) we played our normal level and beat both opponents by 18 games apiece. Sheer luck against formidable opponents. Heck, tom bain's 2nd serve actually exceeded 20 mph a few times, ron salvador actually hit two service aces (two! count 'em - two! ), milly back actually hit a few topspin lob winners, and regina lindsey actually made a few backhand volleys. Ron & Tom only dropped 3 games in 3 sets of mens doubles. Milly & Regina won 6-0 in ladies doubles against our last opponents. Our 'final' opponent feared us so much they defaulted. But all the luck was used up on the court and the team ended up in a loss at Mohegan Sun.